The devastating economic crisis has affected employment, infrastructure, as well as life in urban centers in Greece. 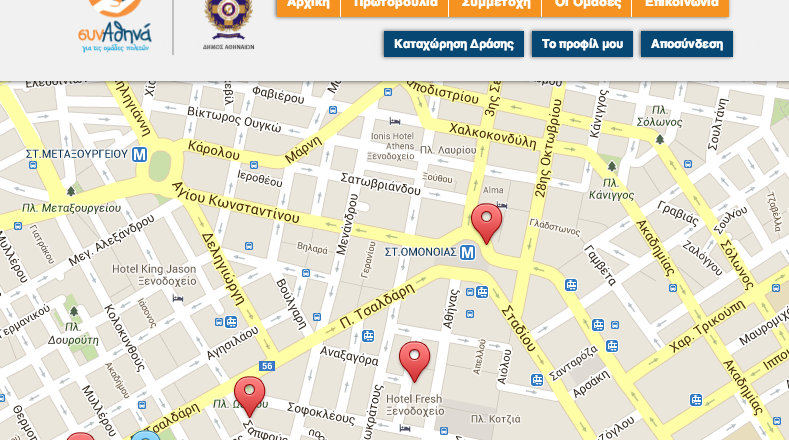 The Municipality of Athens have created synAthina, an online platform to connect members of the community with their local government. Citizens can submit ideas on how to improve their city and will work together with government representatives to develop solutions to local problems, resulting in creative grassroots solutions and a mechanism for bottom-up reform of outdated municipal processes and regulations. The Municipality of Athens wanted to create a community building project in order to create a collaboration and communication platform for the volunteer initiatives that are active in the broad Athens area. a digital platform that facilitate the communication among organizations, citizens and local communities. Bloomberg Philanthropies has awarded accordingly a prize of million dollars that will fund the ‘Syn Athina’ development.